If you follow gaming media in any capacity you have probably heard of Octodad: Dadliest Catch. If not prepare to have your mind blown. Octodad warps your fingers into control of a bipedal sea monster who is also a dad. The catch is that no one knows that you are, in fact, an octopus in a suit. You are tasked with keeping this secret from your wife and children by trying to complete normal tasks in a semi-capable fashion. This may seem like an easy, almost mundane quest. Let me tell you that it is not. Octodad’s controls are deceptively easy to understand. One trigger lifts a leg while the other trigger lifts the other respective leg. While airborne these legs can be swayed in any direction with the left analog stick. While not prancing about, the two sticks serve as direction and depth controls for Octodad’s arm, which can grab pretty much anything. Basically your only interactions are walk and grab but because of the “floppyness” of the fatherly mollusk you are constantly ramming into things and generally wrecking the place. The lack of nimble maneuvers, and clever allowance of the physics engine to go nuts, leads to loads of unintentional hilarity. For example: You are asked early to make a cup of coffee, a relatively simple task. In the process of creating the coffee I broke several plates of fine china, which my children chastised me for; brushed a toaster into the sink, in which my wife was also washing dishes; and knocked over the kitchen table, sending breakfast donuts into the living room. This kind of slapstick relief is a constant in Octodad. Nearly every task you are given leads to silly delight as you create a wave of destruction all around you. Beyond the floppy goofs, Octodad is full of actual goofs. The writing, while not the next American Novel, is consistently sharp and witty. Though the plethora of puns may have skewed my opinion of the writing’s overall quality. The only major downside to this game is its length. If you blaze through the game, squirming past each objective, you are going to have a bad time. Without goofing about the game could easily be completed in around two hours. And if you skipped all the squiggly amusement then there is really very little to see in Octodad. The game shines at its best when you take it slow and enjoy the stupidity. Once you have completed the game it is difficult to go back and enjoy the same mirth of the first playthrough. So take your time to put on goofy glasses and throw things into other things. 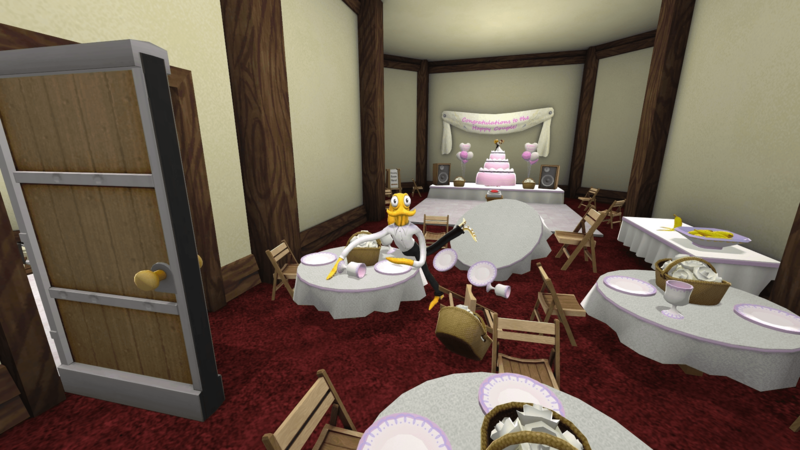 Octodad is some of the most stupid fun I have had in a long time. Just crashing around the supermarket made me laugh harder then most games ever have or will. The key to wringing the laughs out of Octodad really lies within yourself though. You get from Octodad exactly what you put into Octodad. If you like to follow waypoints then stick to something else. If you like to have silly fun with little purpose then do not miss Octodad. Recommended: Recommended games are not held in the same esteem as those of a Must Play. A game that receives a “Recommended” is one that you certainly will enjoy playing, and our editor recommends that you do, but it may have a few problems that stop it from being the type of game you have to have right that instant. Remote PlayOctodad may seem like a challenge to control with the Dualshock 4, and it is, but it is no more challenging on the Vita. There is a slight change to the controls but the translation is rather seamless. The lag also poses very little issue since Octodad is a far away from a twitch game as you can probably be. Great review man. I laughed while picturing the silliness you described. Makes me definitely want to check it out. Just keep in mind the beluga s in the game are real. Nope. Nonexistent. Lies spread by multiple governments and the universe as a whole.